Tesla raised $226 million in its debut on the Nasdaq on June 29, 2010. In their first day of trading, the shares rose 41 percent. Musk owns about 20 percent of the shares and has invested several million of his own $19 billion fortune into it in the years since the IPO. His current stake is $12.8 billion. Tesla is the largest short in dollar-volume of U.S. stocks right now, at $13.1 billion, according to research by S3. Elon Musk says his Tesla electric car company is the most shorted stock in history, citing that as one of the reasons he's thinking about chucking the public markets and taking the $64 billion company private once more. But the stock market — and investors — have been good to Tesla, notwithstanding the high-rolling bets against it at the moment. Tesla raised $226 million in its debut on the Nasdaq on June 29, 2010. In their first day of trading, the shares rose 41 percent. A $1,000 investment at the $17 IPO price would be just over $22,200 now. Musk owns about 20 percent of the shares and has invested several million of his own $19 billion fortune into it in the years since the IPO. A month after the IPO, his stake was valued at $512 million, according to FactSet. Now it is $12.8 billion. Shares of Tesla are up more than 23 percent in the last week alone. Just weeks before IPO day, Toyota Motor Corp. agreed to invest $50 million in Tesla in a joint venture to develop the electric car technology. The private investment was finalized shortly after the IPO was completed, and Toyota and Tesla remained partners until the end of 2014. Then, later in 2010, battery cell supplier Panasonic Corp. put $30 million into Tesla. Toyota sold its Tesla shares by the end of 2016. 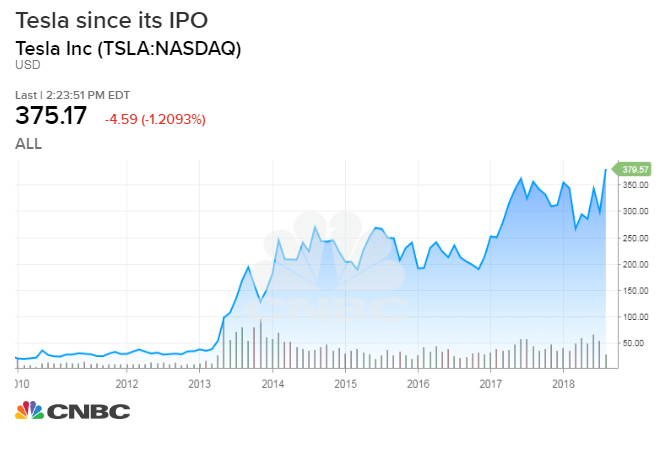 But Tesla has been selling shares throughout the last six years, including a $193 million sale in 2012, a $313 million offering in 2013 (when Musk invested $100 million), a $652 million sale in 2015, (when Musk invested $20 million), a $2.29 billion offering in 2016, and a $402 million sale last year (when Musk kicked in $25 million), according to securities filings. Tesla has raised money in the stock market as it burns through cash, something that has worried investors. Last week it said it expects to spend less than $2.5 billion in 2018, far below the $3.4 billion it spent last year. Musk buys stock periodically, too, most recently adding $25 million shares in June after the company laid off workers. Tesla bought Solar City, another Musk project, in 2016, sending the carmaker's shares tumbling. But they have risen 77 percent since the end of that year. And on Tuesday, just before Musk tweeted that he was considering a take-private at $420 a share, word came out that the Saudi sovereign wealth fund had put $2 billion into the company. So why is Musk complaining? His claim that Tesla is the biggest short in the history of the stock market — which he reasserted in a blog post Tuesday — could be defended for the U.S. market but not globally. Tesla is the largest short in dollar-volume of U.S. stocks right now, at $13.1 billion, according to research by S3. As recently as June, short interest was $13.9 billion, the largest of a U.S. stock since 2016, when S3 started keeping the data for the entire market. But globally, Alibaba is the current leader, with short interest roughly double at $23.4 billion. And in terms of percentage of shares sold short, Nasdaq's leaders are Sirius XM Holdings and Advanced Micro Devices, according to Nasdaq data. Tesla ranked 27th as of July 24. Musk can claim at least partial victory against his critics, according to S3, which calculates that Telsa short sellers are down $3.2 billion so far this year and $6.6 billion since 2016. Bernstein analysts raised the question in a note on Wednesday of who would be willing to buy Tesla at $420 when the stock isn't even trading above $400. A take-private of this size might need more than $60 billion of financing. Aside from the Saudi Arabia investment fund, Tesla's other big holders include China's Tencent, with a 4.9 percent stake, and some mutual fund companies. Softbank's $100 billion Vision fund is one possibility, Bernstein notes. But CNBC reported Wednesday that it recently invested $2.25 billion in GM's self-driving car unit, and isn't involved in Tesla. Six members of the Tesla board issued a statement on Wednesday that said, "Last week, Elon opened a discussion with the board about taking the company private. This included discussion as to how being private could better serve Tesla's long-term interests, and also addressed the funding for this to occur. The board has met several times over the last week and is taking the appropriate next steps to evaluate this."